chapter 10 : Island Relocation of the Secret Christians | Light and Shadow: Christian History, Resurrected. Hidden Christian Sites in the Nagasaki Region. 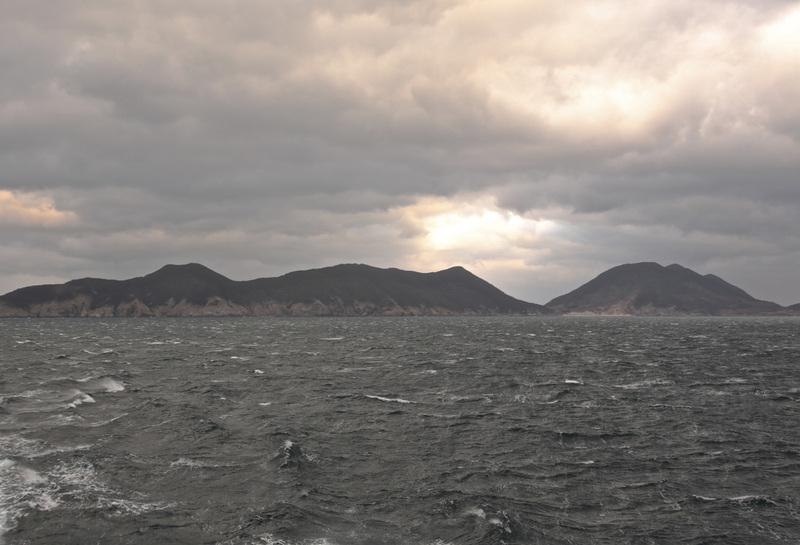 To the north of the Gotoh Islands and east of Ojika Island, there is an island known as Nozaki Island. Currently, this island is mostly non-inhabited but it was previously home to 3 communities made up of approximately 600 people. Of the 3 communities, Nokubi and Funamori were made up of hidden Christians that moved there in the late Edo Period. Even though the land was inhospitable and riddled with steep slopes, the people of the communities worked hard to build a life there. In the Meiji Period, after the lift of the ban on Christianity, the inhabitants pooled their resources and constructed a church. This chapter will tell the story of the people who struggled to finally realize their dream of building a church and how the community was ultimately disbanded to once again leave the land uninhabited. The year is 1716, and Nokubi is originally pioneered by the Oda family in 1716, wealthy merchants of Ojika Island, for the purpose of whaling. Due to the lack of flat land and too many steep slopes, it seems that no one had chosen to live on the island permanently. Later, in 1797, the Gotoh clan calls on the Omura clan to send people to develop and pioneer the land. The Omura clan responds by sending approximately 100 people to Gotoh. It is said that most of those sent, were in fact, underground Christians. When news that land was being given to the pioneers, the number of people increased. By the end of the program, more than 3000 people had relocated to Gotoh. 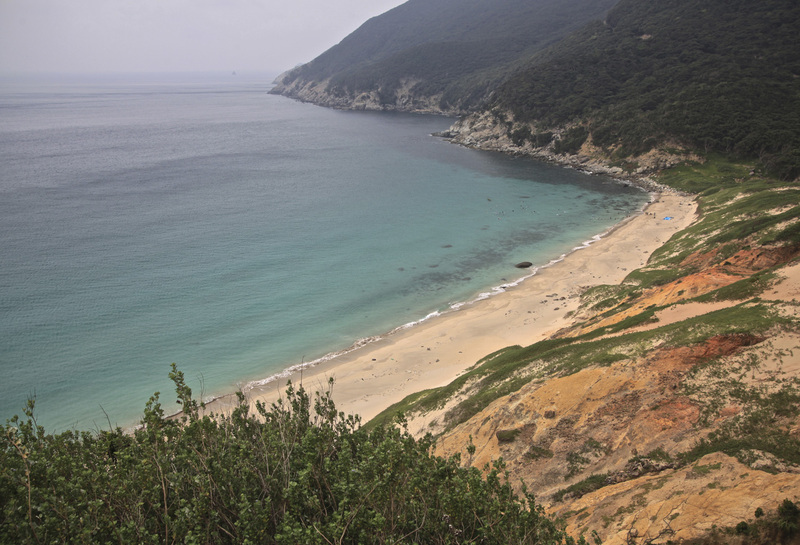 2 of the pioneering families traveled through Shimo Gotoh, and crossed over to Nozaki Island. These people are said to be the originators of the Nokubi community. The people of Nokubi experienced great hardships while working to level the land to make it usable. Living far from their homelands, they secretly kept their Christian faith. After living in these conditions for over half a century, they received big news from Nagasaki. In 1865, a hidden Christian from the area of Urakami, met a priest in a Nagasaki church made for the French, the Ooura Tenshudo. This encouraged the Christians of Nozaki Island and they began to communicate with the priests of Ooura Tenshudo. In 1867, 6 people received baptism at the Nagasaki church. This is still during the era of forbidden Christianity. Unfortunately, this activity is known to the government officials on Ojika Island, and the hidden Christians of Nozaki Island, about 50 people, are taken away to Hirado to be tortured for the purpose of religious conversion. The people endured the torture and together accept their religious conversion. Finally, when they are allowed to return to their settlement on Nozaki Island, they are met with the tragedy of all their homes and household belongings taken or destroyed. It seemed that the prosecution of Christians was as deeply rooted as ever. All these people could do was wait for the lifting of the ban on Christianity which would come in 1873. 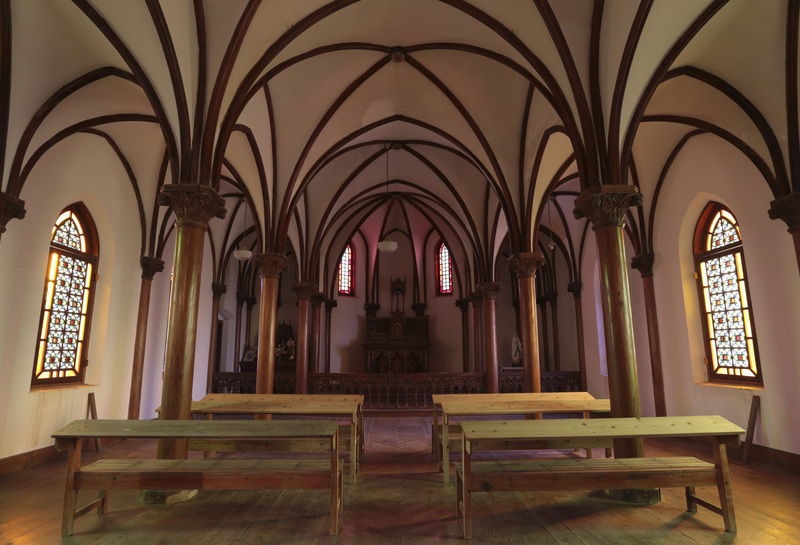 In 1882, a wooden church is constructed for the community of Nokubi. At last there is a place to represent the faith of the people. Later, in 1907, an agreement is made by 18 households and a brick and mortar structure is planned. After much sacrifice and dedication by the members of the community, the long-awaited Nokubi church was completed October 10th, 1908. 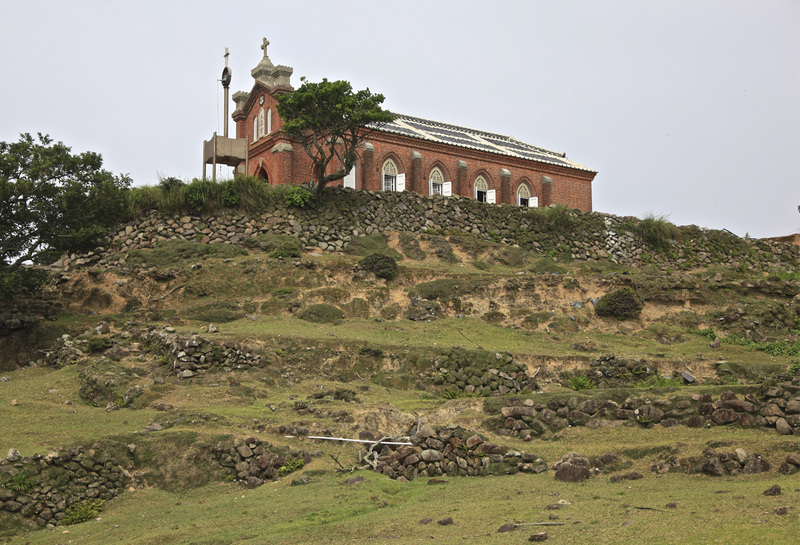 The church on a hill overlooking the blue sea may be small, but it was a beautiful site to see. 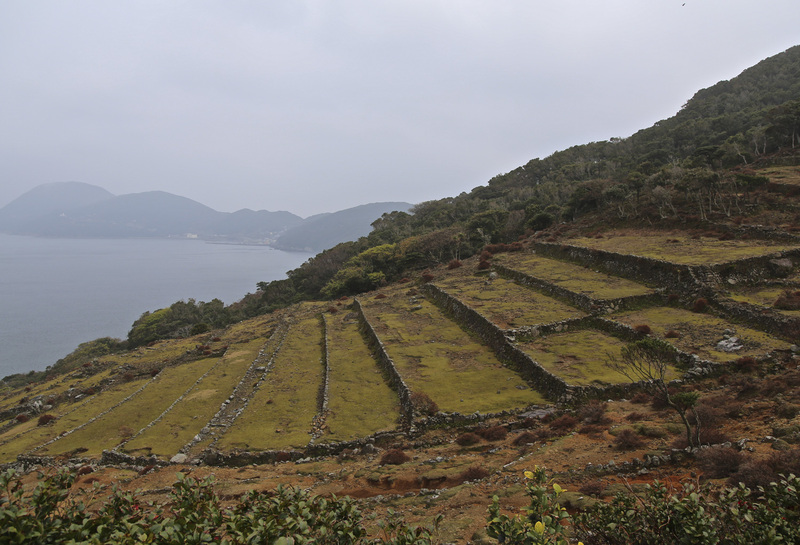 Another community of Nozaki Island, Funamori, is said to have originated in 1840. Around this time, a wholesaler on Ojika Island named Taguchi Tokuhiraosamu, came to visit the outskirts of the Omura Clan area. It is said that there he met 3 sad-looking men standing on the beach. When he asked them why they appeared so sad, they said that they were hidden Christians and were slated to be executed the next day. Tokuhiraosamu felt sorry for them and so decided to hide them in his ship to take them to Ojika Island. Upon departure, the ship was searched by a government offical but they were able to reach their destination without detection. The story says that since it was uninhabited, he gave the 3 men a place to live and work in Funamori, Nozaki Island. After hearing this story, other hidden Christians immigrated from Hisaga Island and Naru Island. At it’s peak, it is said that more than 150 people formed the community of Funamori. In 1882, they built a wooden church. For a long time to come, the quiet prayers of this church would be heard. After World War Two, as Japan began it’s reconstruction efforts, the population of Nozaki Island begin to decline. The young generation that went off-island to study or work, stopped returning to live on the island. At the end of the war, there were 34 households in Funamori, yet by 1965, there were only 13 left. The following year, there was a mass exodus to Ojika Island. In Nokubi, there were 28 households in 1950 with a population of 171. In 1970, it was down to 6 households with a total of 28 people. In next year, these people relocated to Fukuoka or Kita Kyushu. After many of years of concealment and keeping their faith in tact, and while realizing the dream of building a church, close to a century has passed. Once again, both Nokubi and Funamori have become non-inhabited places. Currently, the wooden buildings of the communities are broken and run down. It seems sad that only the Nokubi Church remains in tact. It was never really viable for people live on such inhospitable land. But on the other hand, the fact that Nokubi and Funamori are no longer inhabited, is possibly proof that Japan is now in a modern age of religious freedom. All people are free to live where and how they choose.